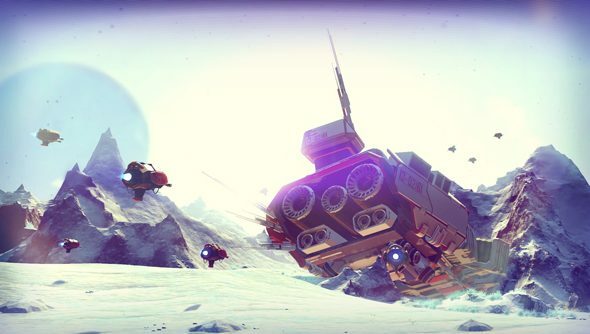 Hello Games’ unpronounceable No Man’s Sky has all the hallmarks of a quintessential PC game: procedural generation. Infinite exploration. And y’know, space. But its appearance on Sony’s stage at E3 had worried PC gamers, and few words of reassurance have been forthcoming. Until now. Sean Murray clarified Hello Games’ PS4-first release in the September issue of Edge. The game will definitely come to PC after a timed exclusivity deal with Sony expires. “I actually got in a bit of trouble for saying that we wanted the game to feel really ‘console-y’,” said Murray. “We’ve always had PC in mind but in my head [console-y] means solid framerate and immediate controls. Absolutely. And the PS4 focus will likely pay dividends for PC gamers eventually. The new console’s hardware means the Hello Games team aren’t compromising in their procedural generation algorithms. As ever, E3 policy is as follows:don’t mention the PC. These things have a way of working themselves out for the good of the platform, don’t you find? And in the meantime, there’s always the 15 best space games on PC.